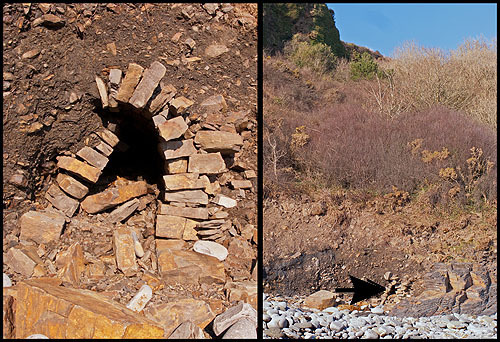 Following the storms of 2014 the partly collapsed Bridges Patch Tunnel , on the beach about 300m east of Wisemans Bridge Inn , has been uncovered. Traditionally coal and iron ore was loaded into open boats beached on the sands below the mining areas - “patches”. From 1849 to 1888 tunnels from the 'Bridge Patch' and 'Crickdam Patch' allowed coal and iron ore to be transported by Drams to the Saundersfoot Railway line and then on to the Kilgetty Ironworks ( Stepaside ).